On a hilltop outside Sderot, Israel—a city that sits just a mile away from northern Gaza—locals cheer as missiles flash before them in a grisly ritual neither side can resist. Israelis on a hilltop overlooking Gaza cheered as missiles flashed before them on Thursday. "It is an astonishing, macabre, and awful thing, really, to watch this display of fire in the air," CNN Correspondent Diana Magnay remarked in a live broadcast when a missile erupted—along with applause from Israelis who had gathered on the hill outside Sderot, a city that sits just a mile away from northern Gaza. 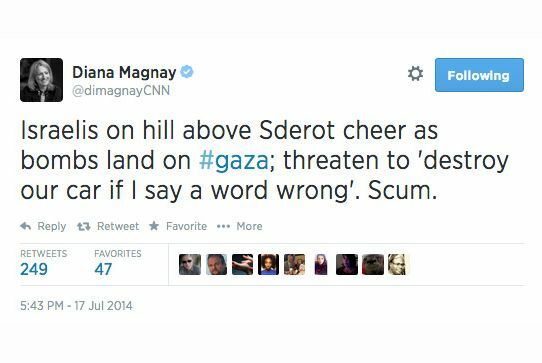 Shortly after she signed off, Magnay tweeted, "Israelis on hill above Sderot cheer as bombs land on #gaza; threaten to 'destroy our car if I say a word wrong'. Scum." Though she quickly deleted the tweet, many saw it as unprofessional and questioned whether Magnay could report on the conflict in an objective manner. CNN reassigned her to Moscow on Friday, though a network spokesperson told The Huffington Post, "She deeply regrets the language used, which was aimed directly at those who had been targeting our crew" and not everyone present at the scene. Regardless, Magnay seemed to have been taken aback by the hostile behavior of those on the hill. 496 Palestinians, including nearly 100 children, have been killed by Israeli forces so far in this latest round of fighting which began on July 8, according to health officials in Gaza. Israel, which began a ground operation into the Gaza Strip on Thursday, says that 18 of its soldiers along with two civilians have been killed in the conflict. Snacking on popcorn and dragging on hookahs, Israelis continue to turn out to what Dutch journalist Allan Sørensen sardonically dubbed "Sderot cinema," in a tweet that's been shared more than 12,000 times since he sent it out last week. Social media denizens expressed outrage, calling the image—which notably features one young woman flashing a thumbs up—"sickening," "gruesome," and "so pathetic and fucked up." In a post offering context to the vitriolic image, Sørensen writes, "For me, this attitude wasn't to provoke anyone. The people there sincerely didn't think there was anything wrong with what they were doing." That's part of what makes the scene so chilling. Sørensen, a veteran Middle East correspondent, points out that the sort of callous enmity on display at the "Sderot cinema" can be seen amongst Palestinians as well. "On both sides, there's a total lack of empathy that I've never seen before." "It's not a new thing," says Ben Hartman, a journalist with the Jerusalem Post. He says Israelis have been dragging lawn chairs and love seats to the hills outside Sderot for at least the last ten years. "Whenever there'd be some kind of operation or air raid, people in that part of Israel would go to those hills overlooking Gaza and watch." For people living in and around Sderot, the conflict cuts close to home. It might not seem this way to outsiders because the Israeli army is so much more powerful than Hamas-led forces, but Hartman says Israelis living alongside Gaza feel particularly vulnerable to attack. For them, "There's probably a psychological way they feel like they're hitting back." That's because "Sderot cinema" isn't just a front-row seat to a war saga, it's also on the frontlines of an actual battle—even if the foes are dramatically misaligned. "You're just kind of on this exposed hilltop and there's nothing you can do," Hartman, who's been up to the hill numerous times to report on Gaza over the years, tells me from Tel Aviv. "If a rocket siren goes off, all you can do really is hit the dirt because there's no real shelter up there. You can hide behind your car, but of course, you really wouldn't want to be next to a car that's hit." While they're often intercepted or deflected, the Israeli Defense Forces (IDF) believe Hamas has several thousand rockets capable of reaching Sderot from Gaza. That sort of danger might be part of the appeal. "It's great to be here," Aaron Dew, a Jerusalem resident who travelled nearly 100 miles to see the rockets fall, told Nikolaj Krak, one of Sørensen's colleagues. "You can feel the thunder and see the rockets. It is a quest for excitement. Yesterday a rocket landed just below the hill." But the thrill doesn't sidetrack from the primary intrigue of the outdoor cinema. "We sit and look at Israel creating peace," Eli Chone, 22, an American living in Israel, told Krak. Including a 16-year-old who was burnt alive in a suspected revenge attack, more than 100 Palestinians have now been killed for each of the three Jewish students whose murders were exploited by Israeli Prime Minister Benjamin Netanyahu to justify this latest incursion into Gaza. Hamas officials on the ground claim that three-quarters of those that have been killed were civilians. The militant group has already launched retaliatory attacks to counter the Israeli ground offensive and thwart Jerusalem's renewed efforts to destroy underground tunnels the territory relies on for artillery—as well as goods that meet basic human needs amid a blockade. Israeli officials often refer to the structures simply as "terrorist tunnels." "Today, we have come to see the rockets hitting our cities occupied since 1948 and to see these moments of dignity and pride carried out by the resistance in Gaza," a Palestinian man in the West Bank city of Hebron told Reuters as Hamas launched rockets at the Israeli capital of Tel Aviv from Gaza last weekend. After Hamas announced that the salvo would take place on television, Palestinians gathered by the hundreds to cheer on the rockets, shouting chants of "Allah Akbar! "—God is Greatest—as if to push them along. Almost none of them wrought damage or causalities on their Israeli targets due, in part, to the nation's new Iron Dome shield. Another video in which three men excitedly shout in Arabic about rockets sweeping over East Jerusalem led to their arrests earlier this week. "There it is! There it is!" a man working in East Jerusalem tells a coworker. "Lower your voice!" another hisses. The men were accused by area police of incitement to racism, violence, and terrorism, though the grounds appear to have been too tenuous for a formal indictment. The three were released within hours of their arrest. Still, the video gained a wide circulation on social media, and caused, among Israelis, the same sort of vitriol that the "Sderot cinema" tweet aroused in people who support the Palestinian cause. Though he says he's "filled with anger" when he hears of Israelis celebrating attacks on Gaza where he lives, 17-year-old Hossam Alfarra, has very different feelings about Hamas' attempts at retaliation. "It gives us hope to know we can still fight back," he writes me from the city of Khan Younis. For Sørensen, the shock associated with these viral photos and videos points to a broader issue that underlines the conflict outside of the domain of social media. "Almost no one sees the obvious link there exists between the Arabic demonization of Jews and the Israeli demonization of Arabs. For both parts, it's a matter of maintaining the myth that there is a difference," he wrote in an article. "Most importantly, some Israelis and some Palestinians try every day not to face the enemy in the mirror." Follow Beenish Ahmed on Twitter.